Why Teach in a Private School? Henry Adams once said, "A teacher affects eternity." Teachers in private schools profoundly appreciate the eternal dimensions of their work, for they nourish not only the minds but also the hearts and souls of their students. Serving in schools that emphasize a child's complete development, private school teachers have the privileged opportunity to transmit the core academic skills as well as the lessons that count most in life: lessons about spirituality, love, values, the wonder of creation, the purpose of existence. Can any work be more important? Private schools are wonderful places in which to teach. They offer caring, orderly, safe, and nurturing environments; they emphasize the education of the whole child; they insist on academic excellence; and they treat teachers as professionals, giving them considerable autonomy and independence in matters of instruction. The disciplined environment, rigorous curriculum, caring communities, and high expectations private schools provide make them some of the most effective schools in the country. Teachers in private schools can spend their time doing what they are supposed to be doing: teaching. A century ago, many parents counted on schools to help rescue their children from the terrible shadow of poverty. Today, a new generation of children needs deliverance from a far more crushing poverty, a poverty of spirit. In an age which sometimes seems so void of basic values, an age where children are coarsened by the media and numbed by nihilism, parents are calling on private schools to help them infuse their children's lives with purpose and meaning. They desperately want teachers who can enliven the mind as well as the heart; teachers who can call youngsters to a life of service and love; teachers who can not only teach children to read and write, but also to tell right from wrong. The life of the private school teacher is an extraordinary calling. Are you up to the challenge? View CAPE's Video to find out how private schools promote the public good and provide a path to a promising future. May 20, 2009 -- Private school teachers are more satisfied than their public school counterparts with careers, classroom conditions, and school climate, according to a groundbreaking report released today by the Friedman Foundation for Educational Choice. The report, titled Free to Teach: What America’s Teachers Say About Teaching in Public and Private Schools, draws on data from the Schools and Staffing Survey conducted by the National Center for Education Statistics at the U.S. Department of Education. "These are eye-opening data on how America's public and private school teachers view their work and their schools," said Greg Forster, one of the authors of the study. "The results here highlight the professional differences felt by teachers from public and private schools," said Christian D'Andrea, the study's co-author. "While public school teachers are faced with more hassles inside and outside the classroom, private school teachers have much more freedom to teach. These private school teachers report having better working environments and stronger networks of staff support." Private school teachers are much more likely to say they will continue teaching as long as they are able (62 percent v. 44 percent), while public school teachers are much more likely to say they'll leave teaching as soon as they are eligible for retirement (33 percent v. 12 percent) and that they would immediately leave teaching if a higher paying job were available (20 percent v. 12 percent). Private school teachers are much more likely to have a great deal of control over selection of textbooks and instructional materials (53 percent v. 32 percent) and content, topics, and skills to be taught (60 percent v. 36 percent). Private school teachers are much more likely to have a great deal of influence on performance standards for students (40 percent v. 18 percent), curriculum (47 percent v. 22 percent), and discipline policy (25 percent v. 13 percent). Public school teachers are much more likely to report that student misbehavior (37 percent v. 21 percent) or tardiness and class cutting (33 percent v. 17 percent) disrupt their classes, and are four times more likely to say student violence is a problem on at least a monthly basis (48 percent v. 12 percent). Private school teachers are much more likely to strongly agree that they have all the textbooks and supplies they need (67 percent v. 41 percent). Public school teachers are twice as likely as private school teachers to agree that the stress and disappointments they experience at their schools are so great that teaching there isn't really worth it (13 percent v. 6 percent). Public school teachers are almost twice as likely to agree that they sometimes feel it is a waste of time to try to do their best as a teacher (17 percent v. 9 percent). Nearly one in five public school teachers has been physically threatened by a student, compared to only one in twenty private school teachers (18 percent v. 5 percent). Nearly one in ten public school teachers has been physically attacked by a student, three times the rate in private schools (9 percent v. 3 percent). "Documenting existing teacher working conditions is a first step in helping the nation's educational system - both private and public schools - improve working conditions and the overall profession," said Robert Enlow, President and CEO of the Friedman Foundation. Progress Through the Teacher Pipeline, released in December 1999 by the National Center for Education Statistics, tracked 1992-93 college graduates as they wound their way from diploma to first teaching job. The report showed that private school teachers typically were more satisfied with their jobs than their colleagues in public schools. In fact, on all six aspects of job satisfaction examined in the study, substantially higher percentages of private school teachers reported they were "very satisfied" (see chart). Further, 42 percent of private school teachers, but only 23 percent of public school teachers, said they were "quite satisfied overall" during their most recent semester of teaching. Base: 1992-1993 bachelor's degree recipients who first taught after 1992 in a public or private elementary or secondary school. Respondents were evaluating the most recent semester of their most recent job as of 1997. Another measure of teacher job satisfaction is the Schools and Staffing Survey (SASS), conducted by the National Center for Education Statistics. A report from NCES in 2002 entitled Private Schools: A Brief Portrait used 1999-2000 SASS data to show that private school teachers are more satisfied with their jobs than public school teachers--not a trivial finding. Private school teachers are also more content about class size and more likely to say they receive lots of support from parents. By substantial margins, they are more likely to agree that most colleagues share the school's mission and that staff cooperative effort is high. The report notes the significance of the last two items this way: "A school's professional climate, in particular the existence of a strong shared purpose among staff members and cooperative interactions among people at the school, is likely to contribute to its effectiveness." Although complaining about management may be an American pastime, most private school teachers have some positive things to say about school administrators. A majority strongly agrees that the principal enforces school rules (63 percent), expresses expectations for staff (57 percent), and communicates school goals clearly (61 percent). Six of ten private school teachers regard the administration as supportive and encouraging. By contrast, none of those items won strong agreement from a majority of public school teachers. What motivates a person to become a teacher? A study released in May 2000 by Public Agenda examines that question, and the answers are surprising. Higher salaries, which many policymakers now regard as the magic bullet for the looming teacher shortage, may not be what teachers want most, according to the report. "They want to work in schools with involved parents, well-behaved students, smaller classes and supportive administrators, and most would even pass up significantly higher salaries in favor or working conditions that offer these." Private school teachers reported higher levels of morale than public school teachers, a greater sense of being respected and appreciated, and less likelihood to "face a lot of frustration in their work." By a greater than two-to-one margin (54 percent to 20 percent) private school teachers were more likely than their counterparts in public schools to agree strongly with the statement "At my school teachers can count on the support of parents." The report is based on a series of focus-group sessions and national telephone surveys, including one of 664 public school teachers and 250 private school teachers with five or fewer years of experience. The full report, which is entitled A Sense of Calling: Who Teaches and Why, is available on the Public Agenda Web Site. For more information on teacher job satisfaction, read CAPE's summary of a June 2002 report on private schools from the U.S. Department of Education or download the report directly from the USDE Web site. Private schools are known for the high standards they set. Teachers expect excellence from students, and students tend to live up to those expectations. The high expectations and academic rigor help account for above-average levels of student success. If you're looking to help students reach their potential in a school committed to excellence, consider teaching in a private school. Private school graduates are more likely than their peers from public schools to have completed advanced-level courses in three academic subject areas [mathematics, science, and foreign language]. Private school students are more likely than public school students to complete a bachelor's or advanced degree by their mid-20s. According to NCES data, 88 percent of private high school students apply to college, compared to 57 percent of public high school students. And reports from the College Board indicate that SAT scores for private school students are well above the national average. When it comes to challenging students to stretch their capacity, private schools do an exceptional job. Statistics from the College Board and NCES show that for high school seniors, 24.2 percent of private school students took AP exams in 1998, while 9.4 percent of public school students did so. Private schools, which account for only 7.5 percent of all high school students, produced 20 percent of 12th graders who took AP exams in 1998 and 22 percent of those who scored high enough to have the advanced courses count for college credit. November 2009: NAEP Math: Are Reforms Working? The National Center for Education Statistics periodically administers the National Assessment of Educational Progress (NAEP) to test the knowledge and skills of the nation's students in grades 4, 8, and 12. Students in private schools consistently score well above the national average. At all three grades a significantly higher percentage of private school students score at or above the Basic, Proficient, and Advanced levels than public school students. Below are the results from the most recent NAEP report cards. Visit the NAEP 2013 Math and Reading Web Site. Use the NAEP Data Explorer to develop customized reports. Teachers in private schools typically enjoy a considerable degree of professional autonomy. They are not entangled in an elaborate web of regulations that control their every move, but are treated as professionals, and are given the discretion they need to help students succeed. The NCES report Private Schools: A Brief Portrait showed that teachers in private schools have more influence on school policies and teaching practices than their counterparts in public schools. When it comes to practices such as selecting teaching techniques, evaluating students, selecting textbooks and materials, choosing content, and disciplining students, private school teachers are more likely than public school teachers to see themselves as having a lot of control (see table). And in matters of policy, the report notes substantial sector differences in the percentage of teachers who see themselves as having a lot of influence in establishing curriculum, setting student performance standards, setting discipline policy, and evaluating teachers (see table). In short, the data suggest that private schools trust the professional judgment of teachers and value their counsel. Progress Through the Teacher Pipeline, released in December 1999 by the National Center for Education Statistics, tracked the demographic characteristics and academic preparation of 1992-93 college graduates who became teachers. According to the report, graduates with higher college entrance examination scores were more likely to teach in private schools. Although private schools attracted 13 percent of first-time teachers overall, they drew 26 percent of the teachers who had college entrance examination (CEE) scores in the top quartile. Looking at the data from another angle, 38 percent of the private school group had CEE scores in the top quartile, compared to 18 percent of the public school cohort. The ability of private schools to attract teachers who were higher-achieving college students was also reflected in SAT scores. 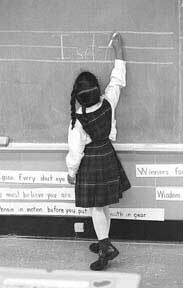 The average composite score of those who taught in private schools was 1136, 100 points higher than those who taught in public schools. For the latest information on professional environment, read CAPE's summary of a June 2002 report on private schools from the U.S. Department of Education. In June 2014, the Bureau of Justice Statistics and the National Center for Education Statistics released Indicators of School Crime and Safety, 2013, which provides a comprehensive picture of the exposure of students and teachers to crime in schools. While the report's main focus is public schools, a few of its many charts and tables also extend to private schools. The charts below capture the major findings of the report that involve private schools. January 6, 2014 --Contentment with one’s career is a blessing to be cherished. Not everyone enjoys their job, but those who do seem to sense that they’re “at home,” fulfilling what they are called to do in a setting that feels right. Working conditions contribute a lot to such contentment. If one feels supported, affirmed, and appreciated, and perceives the workplace as pleasant, the contentment factor grows. New data from the National Center for Education Statistics (NCES) show some significant differences in job satisfaction and perceived working conditions between teachers in private schools and their counterparts in public schools. Despite earning lower salaries, teachers in private schools are more satisfied with their careers, feel more recognized and supported, and are less stressed about their job setting than teachers in public schools. They also report lower rates of problematic student behavior. Find out more in the January 2014 issue of CAPE Outlook . 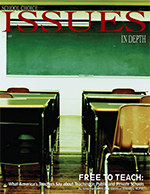 September 2, 2014 -- Two related federal surveys of school administrators offer fresh insight into the working conditions that principals face on a day-to-day basis. One survey shows that principals in private schools report far fewer instances than public school principals of physical conflict among students, bullying, and acts of disrespect against teachers. Discover a host of other interesting findings from the surveys in the September issue of CAPE Outlook . Teachers in private schools are enormously dedicated. With their interest being a child's entire development, they tend to build strong bonds with students and their families. In response, parents and students generally give high marks to private schools and have great regard for the teachers who staff them. Most studies of school choice for low-income families find that parents whose children attend private schools are much more satisfied with various elements of school life than parents of students in public schools. To illustrate this point, the following table compares the attitudes of two sets of low-income parents who applied for privately funded scholarships in Washington, DC: those whose children received the scholarships (as a result of a lottery drawing) and those whose children did not. The table reflects data in a 2000 report from Harvard University entitled School Choice in Washington, DC: An Evaluation After One Year. Private schools focus on the essentials -- that which provides purpose and meaning to life. The sad reality is that our society is marked by a great fear that fundamental values are coming undone. Within that context, a growing number of parents desperately desire the opportunity to choose schools whose primary purpose is to provide youngsters a sound moral and religious education. Private schools are the only schools we have that can assist parents with the religious and spiritual development of their children -- a sphere of development so essential for their complete and proper upbringing. In November 1999, the National Center for Education Statistics reported on the participation of students in grades 6-12 in community service projects. The report showed a significant difference in community service based on the type of schools that students attend. In public schools, 50% of students in grades 6-12 in 1999 reported participating in community service. For church-related private schools, the participation rate was 72 percent and for non-church-related private schools it was 68 percent (table 2 of Service-Learning and Community Service Among 6th- through 12th Grade Students in the United States: 1996 and 1999). ↑ Why teach in a private school?